I walked up to the train hotel in Madrid like a giddy school boy about to go on his ever first school holiday. For Canadians, trains are a bit of a treat; they are expensive and there are no short distances distances to travel. So riding the rails across Europe using my Eurail pass was perhaps the most special part of my trip. Having upgraded my ticket to Lisbon from a regular seat to a sleeper car, I found myself as excited as I would have been for any great adventure. I dove head first into my room, apparently the first to arrive and immediately chucked myself and my bag onto the top bunk that I had been assigned. I laid down on my back looking up at the room and again laugh at the privilege that is my life. Within a couple minutes my roommates arrived, a couple Chinese students on an incredibly brief break from school in England, and a jovial Brazilian man who no one could understand. They all seemed just as excited at this venture as I am. All have smiles on their faces, and all seem intent on exploring every inch of our tiny train home. As the lights dim later in the night, we continue chatting on as if we are 10 years old and having a sleep over. As soon as calm graced the air a quickly spoken line broke the silence and we all laughed as quietly as possible as if to not disturb our guardians. Travel has a way of bringing out the inner child in all of us. For children, every new adventure is a great exploit, every new space is a wonderful new park, and every new person met is a new friend. But once we grow up we often stop having as many new adventures, we stop growing as optimistically, we stop exploring with such curiosity, and quite often we lose that enthusiasm for life. But in travel, each day offers us something new. It may be a new food, a new friend, a new challenge, or even a simple new experience like riding in the sleeper car of a train destined for Portugal. Early in the morning were are awoken by the gentle whisper of the train’s stewardess and we rise to a new destination, and hopefully a wealth of new experiences. Throughout Europe I had found myself craving something new, something wild, and something adventurous. In many ways, I had worried that Europe was perhaps too tame for me. But in the end, I realized that perhaps I was simply being too tame for Europe. Perhaps, the ease of the continent was leading me to believe that there wasn’t as many adventures to be had. The world is your jungle gym. But just like a kid, we have the choice to use the slide as a chair for our moping, a toboggan ready to be sled, or a mountain waiting to be climbed. 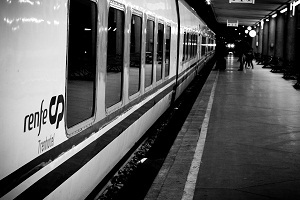 The world is what we make of it, and I’m just glad that I was reminded that while riding the midnight train to Lisbon. ***Note: Eurail is one of my sponsors. They have not influenced the content of my article nor have they demanded that I right on this topic. I am a journalist, and regardless of whether or not they are a sponsor I call it as I see it. After using the Eurail, I can’t imagine travelling Europe without one. I’m writing a couple pieces on my experience in Europe with a Eurail and you can also read about how much you can save using a Eurail. It has been a while since I took a night train in Europe but I always liked the fact that you could go to sleep in one country and wake up in another. Jeff – That really is the beauty of it isn’t it? Always cool waking up somewhere new. I always compare myself to a sponge when I travel because I “soak up” everything! The culture, fashion, food, music, people, animals, flowers, architecture, museums, etc… It sounds like that is what you do as well. I agree, it does bring out the child in all of us. Your job sounds amazing! How lucky you are! Sally – The beauty of travel is that you can also learn how to take ‘being a sponge” home with you. We forget there is lots we can learn even at home!